Update: UL has revised their Printing UL Marks document to version 6.0. This change includes references to the new enhanced marks. More importantly, it also made a fairly significant update to the authorization path for Type R Marks. 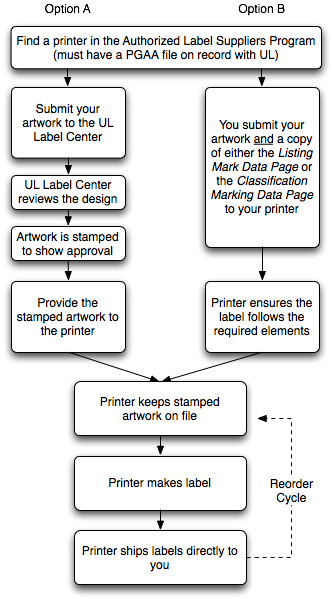 UL has explicitly stated that it will no longer review artwork submitted from label printers–only the end user of the labels. As such, I have updated this article (originally posted May 2014) to reflect this change. Yesterday, I discussed the development path for Type L Follow-Up Service (FUS). Today I’m going to cover it’s brother: Type R.
When it comes to printing custom UL certification Marks (aka the UL logo), there are general similarities between Type R and Type L. Both need a UL Authorized Supplier, and in both cases there has to be verification that the document meets the specs in the your UL procedure. As you can see there are two different ways to go these labels, but it basically works out to be design, verify, and print. Verify is perhaps the most important step. It is with these type of labels, that companies can get into trouble. Maybe they didn’t use an approved printer or maybe the printer didn’t hang onto their records, but there have been a few situations when all of sudden their labels didn’t match up with the required specifications on their markings page, and they need someone to fix the labels quickly. I guess with more freedom comes more responsibility.